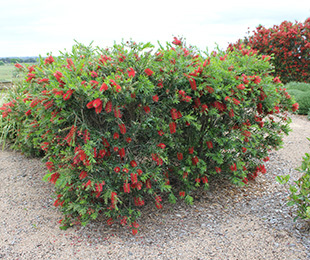 Description: Macarthur™ Callistemon incorporates two of the most popular varieties on the market, Little John and Captain Cook. It features a more compact growth habit and better flower presentation. Macarthur™ Callistemon has fresh green toned foliage with very bushy and tidy growth. Responds very well to pruning after flowering. Position: Full sun to part shade. Tolerates most soil conditions. Tolerates frost and drought. Care: Water as required for 8-13 weeks until established. Plant in a well mulched garden (chunky mulch is recommended). If required use slow release fertiliser in spring. Prune to shape 1-3 times a year after flowering for a hedge (this depends on your requirements, more frequent pruning will provide a tidier hedge/shape). 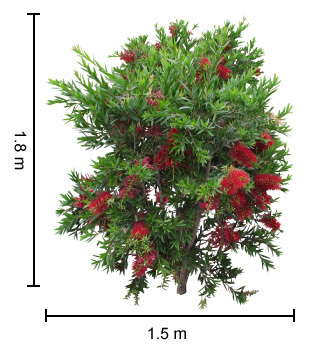 For more detailed information on Macarthur™ Callistemon click here.